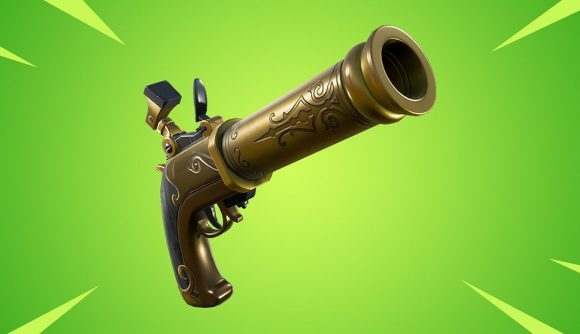 Fortnite developer Epic Games has confirmed via an in-game message that the recently leaked Flintlock pistol will be released into the game very soon. The gun, which was uncovered during the v.8.10 patch by prolific dataminer Lucas7yoshi is said to have been hidden in the games files. Much like a real Flintlock Pistol, stats and animations leaked during the datamine have revealed the weapon is likely to pack something of a punch. It’ll likely be able to one-shot opponents, particularly if you can pull off a headshot, but will take a while to reload. Lucas7yoshi also uncovered audio files in the datamine, which seem to confirm the sheer impact of the gun’s shot. The teaser image has confirmed that the gun will have an Uncommon Rarity, though following Fortnite’s weapon trends, we can guess it’ll like have a rare and common variant too. The gun is already causing a stir in online forums, with some hoping that it will work as a bridge between a standard pistol and the coveted Sniper Rifle. There’s likely to be more info soon, though players are already growing restless awaiting the next rumoured weapon announcement, which is thought to be a bow held by Ember in one of the game’s previous loading screens. Read more: Check out our Buried Treasure guide to find the best loot in Fortnite. The announcement of the Flintlock pistol comes just days after the announcement of whacky vehicle The Baller, which puts players in a small hamster-ball and sets them gunning around the map.